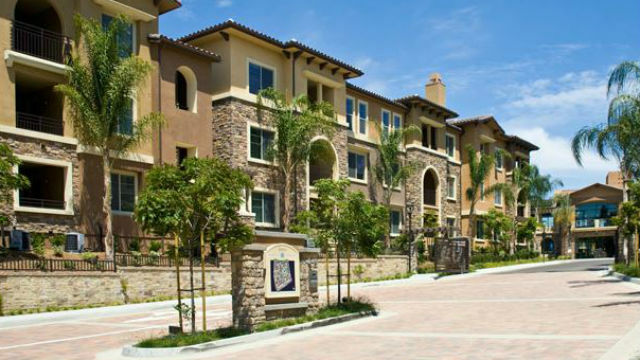 Entrance to the Aquatera apartments in Mission Valley. 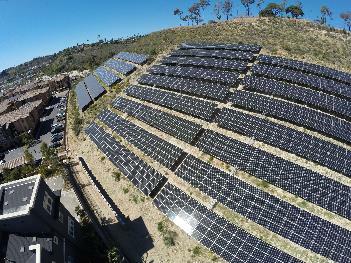 Aquatera, a 254-unit eco-friendly apartment community in Mission Valley, has taken energy consciousness to a new level by enabling residents to get 100 percent of their electricity from the sun. When first built in 2009, Aquatera featured a 282-kilowatt photovoltaic solar energy system that supplied 90 percent of the community’s common-area electricity. Developer H.G. Fenton Company installed new solar panels this spring to add 539 kilowatts of solar power capability. Each apartment unit now features sophisticated Nest thermostats so residents can control the power use in their unit as well as their individual utility bills. “Our residents can control how much energy they consume and have the potential to reduce their energy costs to zero or even receive a rebate,” said Mike Neal, president of H.G. Fenton. Aquatera exceeds California’s energy efficiency standards and includes many other sustainable features like electric vehicle charging stations, a solar-heated swimming pool and water-smart landscaping measures such as an underground well system, drought-tolerant plants requiring minimal to no irrigation and synthetic turf in place of grass. The complex is the second all-solar apartment community in San Diego and one of the first in the nation to offer “net zero” living to residents.